This weekend IMSA hosts one of the world’s most prestigious endurance races: The Twelve Hours of Sebring. Set in central Florida, the race takes place on the infamous course which was once Hendricks Army Airfield. The venue saw its first race in 1950 with the first twelve hour event being held in 1951. 2019 marks the 67th running of the event. The course is known for bumpy conditions which push cars and drivers to the limit. Acura has entrants in two classes at this year’s event. The pair Acura Penske DPi entries will be strong as the teams and drivers will be hungry to make up for their performances at the Rolex 24 earlier this year. We should expect at least one car to be on the podium and also be a contender to win, it’s anyone’s guess whether the number 6 or number 7 car will come out on top. In the GTD class Meyer Shank racing will field two NSX GT3 EVOs. These teams will also look to improve on their Rolex 24 performance. The number 86 car could be a contender for a podium. Expect a solid mid-field finish for the crowd favorite number 57 car which features the only all female driver’s lineup. For more including TV Times, track map, and other links click over to TOV-M! Also, Honda fans, today is the Alan Jay Automotive Network 120. Five (5) Honda Civic Type-R TCRs will be competing in the Touring Car class. One of the teams is HART Racing with Ryan Eversley and Chad Gilsinger piloting the number 89 entry they lovingly refer to as Scarlet. Tune in on IMSA.tv today 11:55A EST or for a re-broadcast next Thursday check out NBCSN at 3:00P. These are always worth a watch. I believe HART was P2 in one of the practice sessions. They will be anxious to let that car loose after being given the Penske DPi fuel by mistake in Daytona which killed their pace. ^ mentioned above. But yes, great guy and great social media presence. Hopefully he'll be eating podium pizza later today! 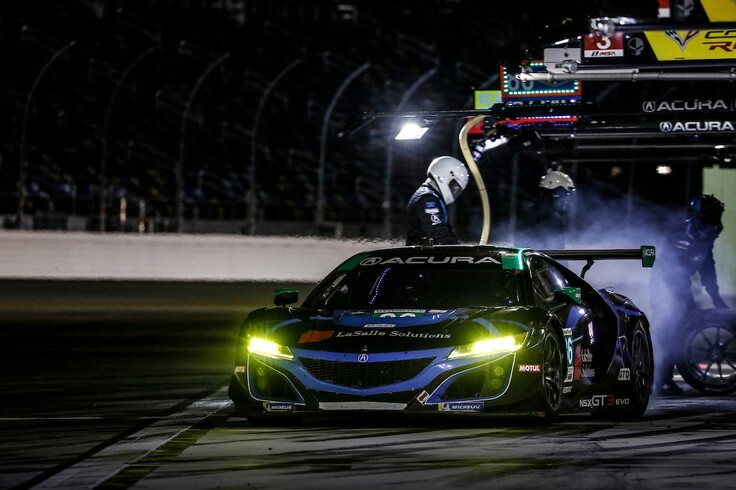 2 Poles for Acura in Sebring 12 Hours! Dane Cameron on overall Pole for Acura Team Penske. Helio Castroneves tied Mazda's Tristan Nunez for second but will start third because Nunez did his time first. Trent Hindman on Pole for GTD class with the Meyer Shank #86 Acura NSX GT3 Evo. Christina Neilsen 6th in GTD with the #57 Meyer Shank Acura NSX GT3 Evo. That's awesome! Those Penske dampers are going to be working overtime! As you know a lot can happen in 12 hours but you can't ask for a better place to start! The #37 LA Honda World Civic Type R TCR of Tom O'Gorman won the TCR class of the Michelin Pilot Challenge. Ryan Eversley was third in the HART #89 Civic Type R TCR. And the start with rain. Interesting comments about Brandon Hartley feeling back at home. It would be cool to see him do well. Not the result we wanted to see given the starting positions. For a Penske car it was surprising how poorly the Acura did in the rain. The 7 car had pace later in the race but it was too little too late. They need to get it together and turn in some performances worthy of the Penske name. On the GTD side there were some opportunities later in the race but both teams were continually out of sequence when it came to pit stops. When the race first went to green and it was still raining, the Penske-Acura cars reminded me of the F1 cars on slicks in the rain at Brazil a couple of years ago. The Cadillacs just took off into the distance. Sort of the same story as at Daytona with the Cadillac chassis apparently dialed in perfectly. Both of those instances point to Penske being out to lunch on Chassis setup, which is supposed to be their strength that they are bringing to this partnership (along with driver talent). I have not been able to confirm this, but for reasons that I cannot fathom, they had a dry setup on the cars at the start of the race. Maybe the rain surprised them? Perhaps the big advantage they have in damper tech allows them to run a stiffer set-up than the other teams can run on such a bumpy track, which equates to speed in the dry but if it rains, they can't go as soft as the other teams can for a wet track?? I can't see a Penske outfit being caught with the wrong set-up? There have been whole seasons in Indycar where Penske has been out to lunch.